2. NEEDHAM3 RILEY (JOHN2, EDWARD1) was born Abt. 1799 in North Carolina, and died Aft. 1840. He married (1) WINNIFRED OUTLAW Abt. 1822. She was born 1790, and died 1852. He married (2) ANNA TILLER 1853. She was born 1806 in South Carolina, and died 1870. Needham married Ann in ca. 1853, after the death of his first wife Winnifred. Needham & Ann, along with Pinckney and several offspring of Ann's from a previous marriage, moved as a family to Washington County, FL. James H. Riley found entries in 1860 Washington Co, FL, census as 'Anna (54), SC'. The same census lists Tiller: Edmond (21), Craton (17), Purtiman (7). See James H. Riley for additional details. i. CANDACE4 RILEY, b. 1823; m. JOSEPH REDDICK WOODHAM. ii. MARGARET RILEY, b. 1830, South Carolina. iii. WINNIFRED RILEY, b. 1831, South Carolina. iv. JOHN EDWARD RILEY, b. 1832, South Carolina; d. 1862; m. CHARITY. 9. v. GEORGE WASHINGTON RILEY, b. 1832, Alabama; d. 1892.
vi. DANIEL RILEY, b. 1836, Alabama; d. 1904; m. RUTH EVANS. vii. ARGENT RILEY, b. 1840, Alabama; d. 1915; m. (1) WILEY PEARCE JR, 25 Feb 1858, Henry County, Alabama; m. (2) ANDREW JACKSON TICE, 19 Apr 1866, Henry County, Alabama. viii. SUSAN RILEY, b. 1842, Alabama. ix. RIDLEY A. RILEY, b. 1844, Alabama. x. PINCKNEY RILEY, b. 1846, Alabama. xi. NELLY RILEY, b. 1847, Alabama. xii. TALLY DANIEL RILEY, b. 1851, Alabama; d. 1899; m. WINNIFRED LISENBY. 3. 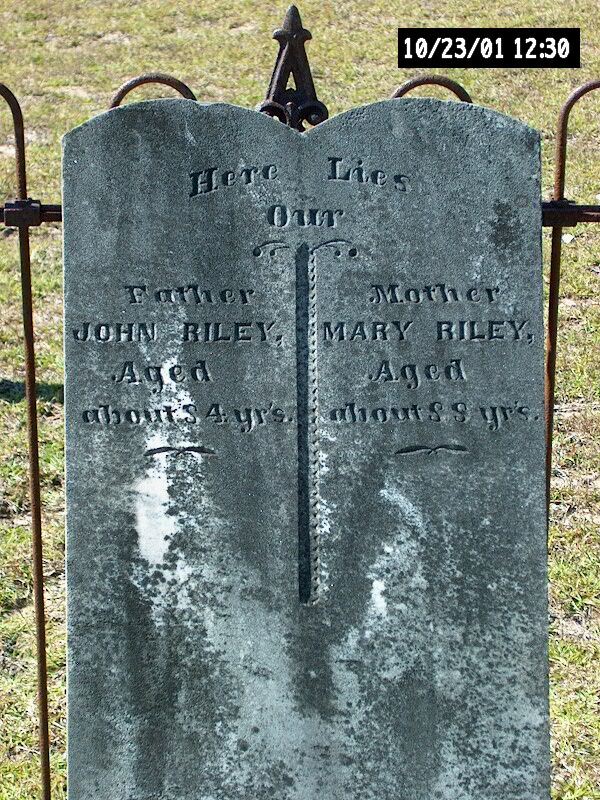 EDWARD3 RILEY (JOHN2, EDWARD1) was born 22 Jun 1801 in North Carolina, and died 15 May 1875 in Dale County, AL. He married MARY POLLY OUTLAW, daughter of GEORGE OUTLAW SR..
i. NEEDHAM4 RILEY, b. 01 Oct 1823; m. ELIZA ANN OLIVER, 26 Feb 1853, Henry County, Alabama. 10. ii. EMANUEL RILEY, b. 1825, Darlington District , South Carolina; d. Bet. 1864 - 1870.
iii. GILLUM RILEY, b. 26 Jul 1829, South Carolina; d. 1909; m. SARAH A. BROWN. 11. iv. WESLEY RILEY, b. 24 Jul 1832, South Carolina; d. 16 Jul 1904.
v. MARY RILEY, b. 1834, Darlington District , South Carolina; d. 01 Mar 1892.
vi. ABSALAM ABRAHAM RILEY, b. 1835, Darlington District , South Carolina. vii. JOHN RILEY, b. 26 Jun 1838, Dale County, AL; m. MARY JANE WOODHAM, 22 Dec 1860. Confederate Army, more information in the 'Military' section of this website. ix. EDWARD RILEY SR., b. 1843, Alabama; d. 20 Oct 1862, Jackson , Virginia. 4. ABRAHAM3 RILEY (JOHN2, EDWARD1) was born Abt. 1803 in North Carolina, and died 1865 in Dale County, AL. He married NANCY ANNA BECK. She was born 1813 in South Carolina, and died in Dale County, Alabama. i. JAMES4 RILEY, b. 1834, Alabama. iii. MARY R. RILEY, b. 1838. 12. v. WILEY WESLEY RILEY, b. 1843, Alabama; d. 1909. 13. vi. GINCY RILEY, b. Abt. 1849, Alabama. 14. vii. WINIFRED RILEY, b. 1849, Alabama. 15. viii. CURTIS RILEY, b. May 1852, Alabama. i. LOUISA4 RILEY, b. 1836.
ii. ROBERT RILEY, b. 1838.
iii. JOHN RILEY, b. 1849. 6. DANIEL3 RILEY (JOHN2, EDWARD1) was born 20 Jun 1809 in North Carolina, and died 29 Jun 1897 in Dale County, AL. He married MARY ANN BRANNON, daughter of ROZIER BRANNON and ANZILLA GALLOWAY. She was born 16 Dec 1826 in Alabama, and died 1891.
i. WILLIAM ROBERT4 RILEY, b. 16 Nov 1842, Dale Co., Alabama; d. 19 Nov 1928, Henry Co., Alabama; MARY E. ROGERS, 16 Apr 1866, Henry Co, Alabama. ii. JACKSON RILEY, b. 16 Jun 1844, Dale Co., Alabama; d. 06 Feb 1919, Alabama; m. JANE L. TRUITT. iii. ISAAC RILEY, b. 09 Feb 1846, Dale Co., Alabama; d. 08 Apr 1857, Dale Co., Alabama. iv. JACOB RILEY, b. 01 Apr 1848, Dale Co., Alabama; d. 17 Jul 1864, Dale Co., Alabama. v. GILLIAM RILEY, b. 1849. 16. vi. ABRAHAM RILEY, b. 18 Sep 1849, Dale Co., Alabama; d. 27 Feb 1923, Dale County, AL. vii. ACAM RILEY, b. 1851; m. L. BRANNON. viii. SARAH ANZILLIE (ZILLA) RILEY, b. 18 Sep 1851, Dale Co., Alabama; d. 28 Mar 1932, Dale Co., Alabama; m. WILLIAM RICHARD NEWTON, 13 Jan 1876.
ix. E. JASPER RILEY, b. 1853.
x. PERMELIA MILLY ANN RILEY, b. 25 Feb 1855, Alabama; d. 06 Aug 1932, Dale Co., Alabama; m. RANSOM CASWELL DEAL, JR., Abt. 1876. 17. xi. JOSEPH A. RILEY, b. 31 May 1855, Alabama; d. Feb 1926, Henry Co., Alabama. xii. ALEXANDER RILEY, b. 07 Sep 1857, Dale Co., Alabama; d. Mar 1929, Dale Co., Alabama; m. ENORA EVALINE DEAL, 01 Feb 1887, Dale County, AL. 18. xiii. JAMES EDWARD RILEY, b. 22 Sep 1860, Dale County, Alabama; d. 19 Aug 1947.
xiv. GEORGE WASHINGTON RILEY, b. 1861.
xv. NOAH L. RILEY, b. Sep 1869, Alabama; m. SALLIE WOOD. xvi. ROXIE ANN MERINDA RILEY, b. 21 May 1872; d. 20 Apr 1937; m. JOSEPH E. RILEY, 15 Jan 1888. 7. ELENDER3 RILEY (JOHN2, EDWARD1) was born Jul 1813 in North Carolina, and died Jul 1895 in Dale County, AL. She married JOHN G. WARD. 19. i. WILLIAM JAMES4 WARD, b. 1834; d. 1886.
iii. MARY LUCY WARD, m. DANIEL CURTIS HUNT. iv. JASPER TERRELL WARD, m. SARAH FLOURNOY CAMPBELL. 20. v. MARTHA ANN JINCEY WARD, b. 23 Jun 1842, Dale County, AL; d. 31 Jul 1909.
viii. SARA JANE WARD, m. TERRELL TAYLOR CAMPBELL. 21. ix. LUCINDA ELENDER WARD, b. 09 Aug 1857, Dale County, Alabama; d. 03 Mar 1934, Alabama. Alabama. He married SARAH ENFINGER, daughter of JACOB ENFINGER. She was born 19 Jun 1819 in South Carolina, and died 30 Dec 1889 in Alabama. i. CHARITY4 RILEY, b. 03 Apr 1841, Dale County, AL; d. 28 Jan 1916, Alabama. ii. MISSOURI RILEY, b. 1846, Alabama. iii. EDWARD RILEY, b. 1848, Alabama. iv. JANE RILEY, b. 1850, Alabama. 22. v. WILLIAM RILEY, b. 02 Apr 1853, Dale County, AL; d. 11 Dec 1900, Dale County, AL. vi. IDA S. RILEY, b. 19 Sep 1858, Alabama; d. Alabama.